"This site is my attempt to share my experiences and the knowledge I have gained along the way in the hope of helping other bunny parents who are willing to love their buns through anything." Our bunny, Bonnie, fractured her spine in June of 2012 at just 11 months old. My husband and I awoke in the middle of the night to her scream. We suspect she was frightened by something and kicked... a little too hard. I turned on our bedroom light to find her laying in her litter box, her legs out behind her. When I went into her x-pen to comfort her, she wouldn't move. She was breathing hard and her eyes were opened wide. I tried to lift her from her box to see if she was okay. Bonnie hated to be picked up, so I was stunned when I lifted her out of her box without a fight. And then I felt a wave of dread when I saw how lifelessly her legs hung below her. My husband and I immediately rushed her to an emergency center. As it was 1 o'clock in the morning and it is notoriously difficult to find a vet, much less an emergency center, that specializes in rabbits, we had to take her to the Pet Emergency and Specialty Center- 40 minutes away. They took her in and began her x-rays and gave her pain medication. We waited anxiously in the exam room for the doctor to tell us the extent of the damage. When the doctor finally came in, she didn't look hopeful. Bonnie had a fracture very close to the base of her spine. To quote her, "the prognosis is not good." Our regular vet agreed a few days later. She said that her fracture is one of the worst she's seen. She said there was not much she could do for her, no real chance of any remedies benefiting her or giving her a chance of walking again. People began talking to us about "quality of life." In surveying doctors' and nurses' opinions, it seemed the common recommendation was to put her to sleep. I was absolutely devastated. We thought long and hard about what to do. About what would be best for Bonnie. About what she would want. We still think about it. Every single day. In my heart, I knew that putting her to sleep, at least at that moment, was not the right path. My Bonnie is a fighter, and if she is still willing to fight, then I will be here to care for her as long as she needs me. As long as she finds curiosity and happiness and enjoyment in life, I will be here to help her. Bonnie is a rescue, a breeder dump that I adopted at a mere 8 weeks old. When I adopted her, I committed to caring for her for her lifetime- including any obstacles we may face along the way. It may not be an easy path, but when she looks up at me with love and a continuing zest for life, I know it is all worth it. So, we have begun the long, hard journey to recovery. As any doctor or nurse will tell you, and as I'm sure you know, caring for a disabled rabbit it NOT easy. It is constant work. Rewarding work, but still hard work. To make it more difficult, there are not many resources out there to help us. When I asked my doctors and nurses for advice on how to care for Bonnie, they have admitted that they are not sure how to handle day-to-day care because, honestly, most parents do not choose to commit to day-to-day care of a disabled rabbit. The help that I was able to find were bits and pieces of single articles attached to other rabbit sites. Unfortunately, I still had questions, I still had concerns, and I still wasn't sure of the best way to care for her. It is such a shame that those of us who love our buns and are committed to their care no matter what their physical limitations may be do not have a proper collection of information to help us do so properly. So, this site is my attempt to share my experiences and the knowledge I have gained along the way in the hope of helping other bunny parents who are willing to love their buns through anything. I hope that you will follow more of Bonnie's journey and that you will feel open to asking questions or sharing things you may have learned in your own journeys. Thank you so very much for joining us on the page and I wish you and your buns the very best! 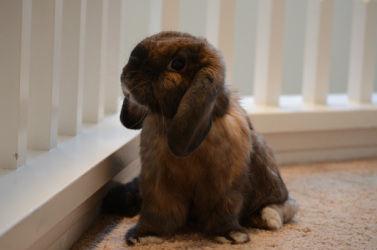 At DisabledRabbits.com, we are focused on providing dedicated bunny parents with the resources, tools and guidance they need to provide their disabled buns with the best possible care for the best possible future. We believe disabled rabbit owners deserve to have resources available to them. We believe that no disabled rabbit should have to be put to sleep simply because an owner does not know that they can be cared for and how to go about doing so. We are not medical professionals. We are simply disabled rabbit owners that are trying to share what we know, what we've learned, so that other disabled rabbit owners can learn to care for their disabled rabbits.